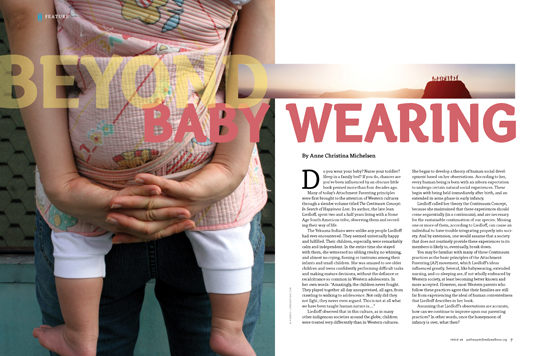 Do you wear your baby? Nurse your toddler? Sleep in a family bed? If you do, chances are you’ve been influenced by an obscure little book penned more than four decades ago. Many of today’s Attachment Parenting principles were first brought to the attention of Western cultures through a slender volume titled The Continuum Concept: In Search of Happiness Lost. Its author, the late Jean Liedloff, spent two and a half years living with a Stone Age South American tribe, observing them and recording their way of life. Liedloff observed that in this culture, as in many other indigenous societies around the globe, children were treated very differently than in Western cultures. She began to develop a theory of human social development based on her observations. According to her, every human being is born with an inborn expectation to undergo certain natural social experiences. These begin with being held immediately after birth, and an extended in-arms phase in early infancy. Liedloff called her theory the Continuum Concept, because she maintained that these experiences should come sequentially (in a continuum), and are necessary for the sustainable continuation of our species. Missing one or more of them, according to Liedloff, can cause an individual to have trouble integrating properly into society. And by extension, one would assume that a society that does not routinely provide these experiences to its members is likely to, eventually, break down. You may be familiar with many of these Continuum practices as the basic principles of the Attachment Parenting (AP) movement, which Liedloff’s ideas influenced greatly. Several, like babywearing, extended nursing, and co-sleeping are, if not wholly embraced by Western society, at least becoming better known and more accepted. However, most Western parents who follow these practices agree that their families are still far from experiencing the ideal of human contentedness that Liedloff describes in her book. Assuming that Liedloff’s observations are accurate, how can we continue to improve upon our parenting practices? In other words, once the honeymoon of infancy is over, what then? 1. The first principle is a profound trust in the child. Caregivers in Continuum societies understand that the child is an inherently “good citizen,” with an innate desire to please and an inborn sense of self-preservation. Instead of warning the child to behave and laying out consequences for bad behavior, Liedloff advocates simply modeling the “good” behavior, and expecting the child to follow suit. If the child errs, he should be gently instructed to change his behavior, but he should never be judged negatively as a person because of his mistakes. 2. The second Continuum concept to keep in mind is that the child should not be the center of attention. Neither, however, should he be excluded from adult society. In Yekuana society, Liedloff observed that adults were available to the child as needed, but focused primarily on their own activities, not on their role as parents. This approach lets the child learn by direct observation and to begin participating in adult activities as he is ready, without the pressure of being in the spotlight. The child needs a mother who is confident and calm…a mother who knows what to do, and doesn’t ask permission from her child. If you’re pleading with her (or asking her to lead), then she’s got the power, and it makes her nervous because it means you’re not sure of yourself, and you’re begging her for acceptance (or direction). Any grown-up lady that pleads with a 4-year-old is not to be relied on. 3. This leads us to the third principle: that a healthy human experience must include interaction between people of many different ages. It is easy for Stone Age parents to be available to their children without making them the center of attention. After all, they live where they work, and their children spend most of their time freely playing with other children, both younger and older than they are. In fact, every person in their culture is able to model older individuals, and mentor younger individuals in turn. This allows for smooth passage from one stage of life to the next, and reduces or eliminates friction between generations. In a society which divides its tribes into isolated nuclear families, where adults must often work outside the home, where children are not typically welcomed into the workplace, and where, from preschool to nursing home, our age segregation practices border on the extreme, is it even possible to offer our children—and ourselves—the experiences we apparently need to become truly fulfilled human beings? Perhaps not to the extent that the Yekuana could. But just as many Western parents have resurrected the practices of babywearing and co-sleeping, why not reclaim the tribal experience as well? Whether through conscious decisions or instinct, many parents are attempting to do just that—resurrect something of the primal, tribal human experience. In their own ways, they are seeking opportunities to connect with other families in ways that are more natural, organically developing and holistic. For some families, tribe-building is as simple as staying in place or moving back to live close to extended family. A recent PEW study revealed that 43 percent of young people ages 18–31 are now living with their parents or other kin. This includes a growing number of families with young children, according to Carmen Wong-Ulrich of Baby Center Financial. Granted, this is happening primarily as a result of economic pressure, rather than the desire for a more natural social structure. However, many of these families are discovering benefits to this arrangement beyond financial relief. “It was nice to rediscover a relationship with my parents as a parent. I don’t think our vision was ever ‘Oh let’s go live with our parents again when we are older,’ but you know, it worked out,” commented one young mother who spent a year living with her parents while she and her husband saved up for a home of their own. Other parents report increased feelings of security, carpooling and other shared duties made easier, built-in babysitters, and family bonding as benefits of living with or near family members. But for the majority of us, living near family is just not an option. What then? Teresa Pitman’s classic article “Finding Your Tribe” offers one solution. First published in 2000, it has been republished many times since, inspiring parents all over the world to create modern “tribal” relationships with friends and neighbors. In the article, Pitman describes her relationship with her friend Vicki. Starting when their first babies were infants, the two would get together and help each other with household chores or prepare meals for both families to enjoy, while their kids had the benefit of unstructured play time with adults who remained in close proximity, but engaged in their own adult activities. It wasn’t until she read Liedloff’s book that Pitman realized she and Vicki had unconsciously created their own little tribal community. Pitman points out that tribe-building involves much more than just scheduling regular play dates. You have to spend a lot of time together, and it’s important that it not just be all “visiting time.” Work together. Clean house, work on your car, do projects together, garden, prepare meals, or start a business together. Take care of the children’s needs as they need you; otherwise, let them alone to observe how you’re going about your tasks— or not, as they please. She also cautions not to be too picky about whom you form your tribe with. Just like family, the people you find available may have some qualities that differ from your ideals. That’s OK; as long as you can respect each other’s choices and beliefs there’s no reason you can’t form a deep and lasting relationship. It’s very common for parents of young children to get together frequently, and often these relationships result in lasting bonds between families. However, once the children reach school age, time spent together in this way often diminishes. Homeschooling families have a unique advantage in this regard. They are also better able to respond to children’s natural developmental patterns, and more likely to have the opportunity to interact with children of a larger age range than their schooled counterparts—an important aspect of Continuum ideals. In situations where homeschooling occurs between and around running a home-based business, children also get to observe and learn firsthand how the adult world operates in a way that was once a normal part of growing up, but now is no longer available to the vast majority of modern children. That said, many homeschoolers still find their lives increasingly dominated by schedules and goals, especially as children grow older. If a tribal experience is truly your ideal, you might find yourself drawn to at least partial unschooling.